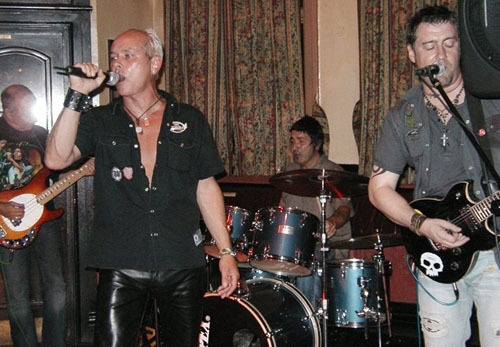 I went to see Tubesnake on Sunday at The Blacksmiths Arms, Gosforth. One of the bands I wanted to see again after Rocketfest2 at The George Stephenson, West Moor (Sunday 19th February 2006), coz I could only see the bass player & drummer that day (it was so full!). They impressed me so much I wanted to see more. I could not see the bass player on this occasion but I’ve seen him play before with a very intense stare as if in a trance & he does the occasional backing vocals. The drummer was excellent especially to The Stones tracks. He looks like a cross between Tico Torres & a young Ronnie Wood. I didn’t appreciate how good a guitarist the lead is at first because I couldn’t see him playing at Rocketfest2, he also does backing vocals and fronts Sabbatica. I saw their first gig, stunning turnout! The singer reminds me of Billy Idol in looks & he certainly gets into character while singing. He’s proficient with Jim Morrison mannerisms & some Mick Jagger without the pout, as well as David Bowie. He’s an ideal front man for the band, charismatic with a brilliant voice. All the songs chosen reflect his voice & he can sing with a deep grainy voice well. Continuing in Jim Morrison style, sporting leather trousers & bearing his body by the end (suitably strange with attitude!!!). The venue was quite full. They were well supported by Tommy & The Oddballs in the audience & Dave from FM popped in later to check them out. This band feeds off an audience reaction so we must have been quite good as it was an outstanding performance. Especially the second half, they performed with a positive passion. They played Lou Reed, Beatles, ZZ Top, and some superb Doors tracks including L.A. Woman, great Bowie including Spiders from Mars. The backing vocals to Gimme Shelter by the lead was very well done considering it’s usually sung by a woman. White Room & G.L.O.R.I.A. (brilliant), Eleanor Rigby with perfected echo and my all time favourite Paint it Black by The Stones. I could listen to them play this all night – I should have got the CD (if they have any left)! Definitely this band should play north of the Tyne more often.